It’s that time of year again. 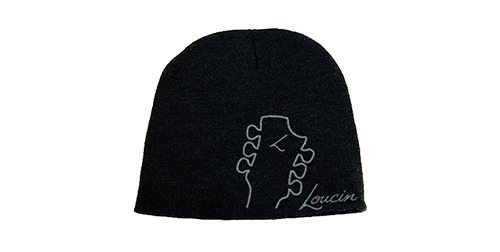 We are offering a limited run of Loucin beanies. This year, there will be only 100 made. When they’re gone….they’re gone! They will be available for shipping in early December. Order yours today! There's a new shirt in town. Get this limited edition preshrunk jersey knit 3/4 sleeve raglan tee while they last. The front features a classic take on the Loucin logo that is only available on this shirt. Available in Heather Grey / Dark Grey only. 50% polyester/25% combed ring spun cotton/25% rayon. Please allow 4-6 weeks for delivery on all apparel. 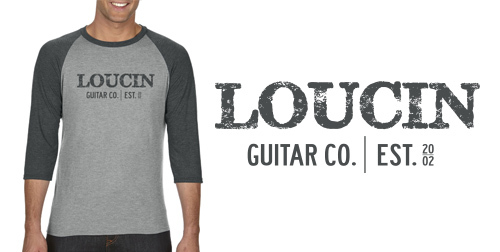 The classic Loucin T! 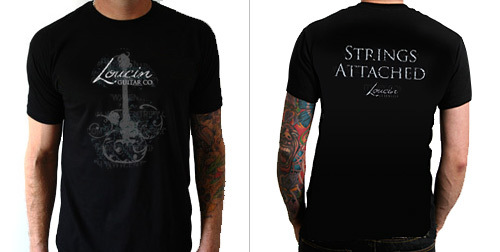 Our custom illustration on the front and "Strings Attached" on the back. All our T's are 100% cotton, pre-shrunk with silk-screened artwork. Sizes below are U.S. Adult sizes. Youth sizes available upon request. This shirt is only available in black. 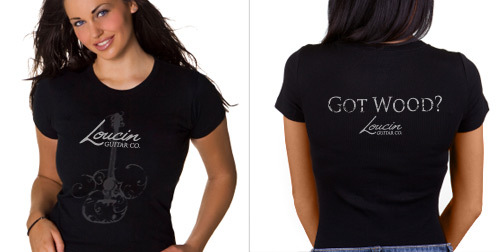 Our classic Loucin T is now available for women! It has our custom illustration on the front and "Got Wood?" on the back. All our T's are 100% cotton, pre-shrunk with silk-screened artwork. This shirt is only available in black. 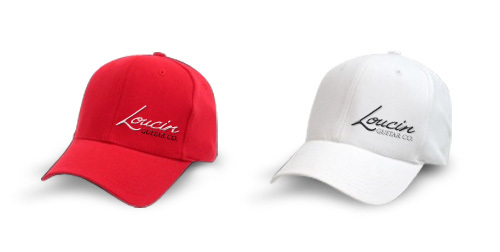 Cap it off with one of our awesome Loucin hats - totally unique, just like our guitars! Our hats are six panel caps with structured stretch-to-fit design that ensures comfort. Flex fitted cap. One size fits most. 80% Acrylic /16% Wool / 4% spandex.